I found out about this RPG Maker event and loved the concept. It reminded me of the Swap-a-thon we held, but more tightly structured, which might encourage more finished works. I thought it might be fun to try applying it to other game development tools. First up: Knytt Stories! WEEK 1 IS OVER. LONG LIVE THE ETERNAL REIGN OF WEEK 2! Participants work on levels. They get half-completed, then uploaded to this event in the comments. Levels are randomly allocated to participants. They get finished off, and submitted to this event as games. Games made for Knytt Swapsies! That said, progress is pretty good so far. I've set up a specific area where the other designer will expand the level. It has two endings, and I'll be handling one of them. Sounds fun, 'm in! Is the idea to only do it for vanilla Knytt stories, or is KS+ fine? I'd probably use the original Knytt stories editor but just to clear it up. I'm gonna do something lame story based on my life and expect the other person to finish it. BUT... it will be in the style which may be amusing to people AND... if the second round I get something that had a lot of effort put into it, I will try to ruin it as much as possible. My personal inclination is to use vanilla KS, but I don't think I'll enforce any rule on this. KS+ and its editor are pretty great for making vanilla KS levels too. I'll be playing in this one. I'll be playing in this one. Should be fun! yeah i used that one. You're right I couldn't wait. I hope whoever gets this has as much fun working on it as I did! That's fine! Signing up is good for keeping track of the entrants, but ultimately the levels uploaded in the comments of this event by the time the deadline arrives will determine who participates in the second half. Alright, it's as done as I can make it! It's yet another one of my pastoral pieces. Here's the status of all the locations (in case you need them): Guest house and garden hermitage are fully done (unless someone wants to add to them); Pool Entrance and Kiddy Pool are mostly done, although very rough; Sea-Stone Pool and path to the Main House have only the first part of their respective starting screens done; and I didn't even want to attempt the main house. Go hog wild! Alright, here is my level. Here's a thing i really should've spent more time on. Here's my bit! To whomever gets this: please make the palette less ugly. Thank you! As for what else you need to do: just make puzzles! Obviously the section with the double-jump needs to be finished, but I'd possibly recommend a bit featuring, mmm... The hologram? Other than that, there's not much logic or story to this level. Go a little crazy! Maybe add some music, too. Hm. I made something inspired by Don't Stop Running! using music by Shirobon. It has no save points because it tries to sync up with the music, but that was getting pretty tough by the time I stopped, so feel free to change direction entirely if you're not feeling it. - the tileset is a little bit annoying to use, i'm sorry. don't feel any pressure to keep a consistent aesthetic if you don't want to! - there are three exits not connected to anything yet, two on one screen. - the yellow section isn't connected to anything yet but does loop on itself. 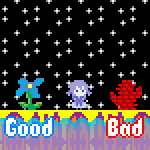 - the areas that are there don't account for high/double jump, so if the player has those they might hit voids. PMs have now been sent out with level allocations, let me know if you have any issues or concerns! Alright! I've finished the half that was given to me. hugs and I are quite pleased with the result. Also, first game in, woot!